I looked at my phone frustrated with being frustrated and upset with falling into the trap every single time. Being lured into someone’s almost way of showing a small glimpse of them caring and then leaving me to fish for the rest. I made her repeat it to me because I really really needed someone to say that to me, to pep talk me through frustration and resist the urge to wine rant at someone who probably is more oblivious than I know. Sometimes you love people really hard and they leave. Sometimes people love you really hard and you leave. Sometimes, you love all the wrong people simply because you want to be loved, we can't help it. We're wired for it. I haven’t quite understood this game quite yet and I hate that we call matters of the heart, a game. But unfortunately it happens and unfortunately we end up hurt and we end up hurting others. That doesn’t change the fact that you deserve to be loved. And it doesn’t change the fact that they deserve to be loved too. I'm not going to sugar coat this because maybe like me you need a wake up call. Maybe like me you just need one of those moments where someone grabs you by the shoulders and tells you to "Knock it off." Stop reaching for people who aren’t reaching back. Stop trying to make yourself fit into people's hearts-- those who are ready for you will have already made room for you. To you who feels as though they need to keep chasing people. To you who feels the need to keep everyone by the means of their own two hands. To you who dims their fire just to make someone comfortable who couldn't handle it in the first place. To you who settles because they don't think they deserve more, guess what? You deserve more. You don't have to sit and wait but it's okay to want to be found, to want to be sought after-- to want to be known by someone. The God who created your very being does that daily but I get it, he created us to crave, to long for that sometimes -- we just forget where to place it. But when we do he whispers, I see you. I know you're heart. I've sent someone on a mission -- they just don't know it's you they're looking for yet. In good time my darling, in good, sweet time. Remember today you are enough. 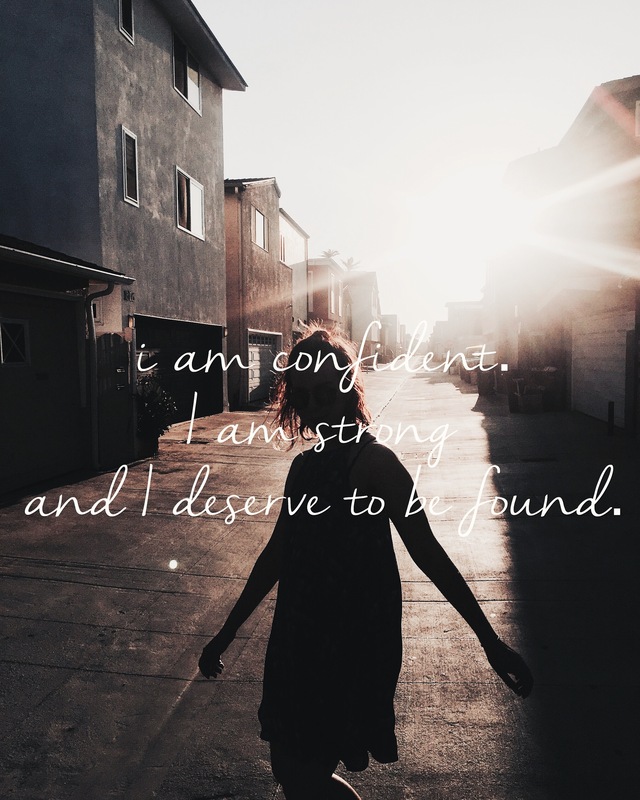 Today and everyday you are confident, you are strong and you deserve to be found.